Approximately, there are 15,000 bail bond agents in the United States, and the bond industry as a whole is worth more than $14 billion dollars. We have had bail, in one form or another, since before the United States gained independence. Both bail and bonds are incredibly important to the legal system. Unfortunately, they are not very well understood. 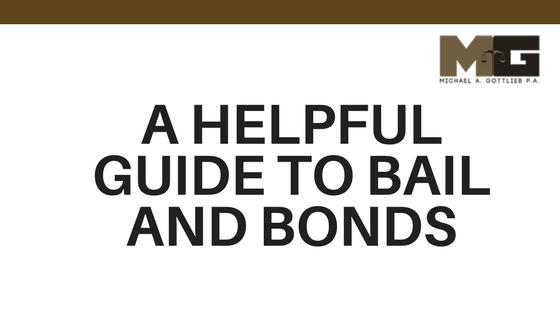 As part of our commitment to the citizens of the State of Florida, we have prepared a handy guide to bail and bonds. Bail and bonds have some similarities and are related to each other. They are not the same thing. People are arrested because there is some suspicion that they have committed a crime. In order to prove that they did a crime, they must go to trial. The trial and the arrest are rarely on the same day, which means that society needs to decide what to do with people after their arrest but before their trial. Posting bail is one action that someone who has been arrested can take. Basically, they can pay an amount in order to not reside in jail while they await their trial. The exact amount is determined by a few different factors: how likely you are to show up to the trial, the severity of the crime, and your situation. In certain cases, a judge may deny someone the opportunity to post bail entirely. The easiest way to think about bail is a short-term loan which is guaranteed by showing up to the trial. You get to live your life as normally as possible until the trial takes place. Once you show up to the trial, you get your money back. We do this because we believe that people should live normal lives until they are conclusively proven guilty. This allows people to take care of their affairs before they go to prison, if they go to prison at all. The Bill of Rights of the United States stipulates that citizens should be protected against excessive bail. What exactly this means is up for debate. The average bail amount more than doubled between 1992 and 2006, and continues to rise to this day. There are many different types of bail, and many loopholes that judges can exploit. Ultimately, the decision is up to the judge. The bond industry revolves around bail. In many cases, someone who is awaiting trial will not have enough money to post bail themselves. They turn to a bondsman in these cases. The bondsman pays the money to post bail, and asks for a percentage of bail in return. For example, if bail is set at $10,000 dollars, the defendant will arrange a fee of $1,000. Part of this contract is a guarantee that the defendant will show up to the trial. If the defendant does not go to trial, they will send a bounty hunter after them. When the trial takes place and the defendant shows up, bail is returned to the bondsman. The defendant’s fee, however, will not be returned. If you have any questions about bail or bonds, contact us today. Michael Gottlieb is an experienced, professional, and persistent criminal lawyer who will fight for you.